What has happened to Porto? As FC Porto released a statement on January 8, 2016, announcing that they were relieving Julen Lopetegui of his duties, it took them only a few words to make a bad season even worse. Porto had already been eliminated from the Champions League and were third in Taça da Liga, but Lopetegui at least had an idea of how the Dragões could compete with the best and improve slowly. Sacking Lopetegui has led the club to a point at which they only try to control the damage. What has happened to the team? And what should Borussia Dortmund expect when they meet the Portuguese in the Europa League round of 32? Porto’s team are characterised by a style of football that emphasises the quality of certain individuals – most notably Jesús Corona and Yacine Brahimi, both attacking wingers. Especially when playing a 4-3-3 shape, the connection between both higher positioned centre-midfielders and the attacking line is weak. As quickly as possible, Porto try to move the ball to the attacking players who then are supposed to create breakthroughs by beating opponents in isolated one-on-ones. Build-up plays usually look stolid, because the centre-backs do not have the opportunity to play to open men through diagonal channels. Moreover, Iker Casillas does not radiate self-confidence and assurance so that he barely gets involved in the build-up, which makes creating attacking plays even harder. In a 4-3-3 shape, the centre-midfielders often disappear behind the opponent’s first pressing line. Even if the number six player drops back, the defenders do not move to the wider zones and advance through half-spaces. Due to predictable passing patterns, it is easy to put pressure on Porto. Overall, they, en bloc, struggle to deliberately generate dynamic, a speciality of Porto teams in the past. At the moment, they merely make individual runs and take individual hits at the defending opponents. The wider positioning by both attacking wingers paired with a lack of presence in the zone behind the centre-forward diminish the ability to pressure the opposing centre-backs, which is why the lone striker usually tends to move around in spacious areas, yet mostly ineffective. 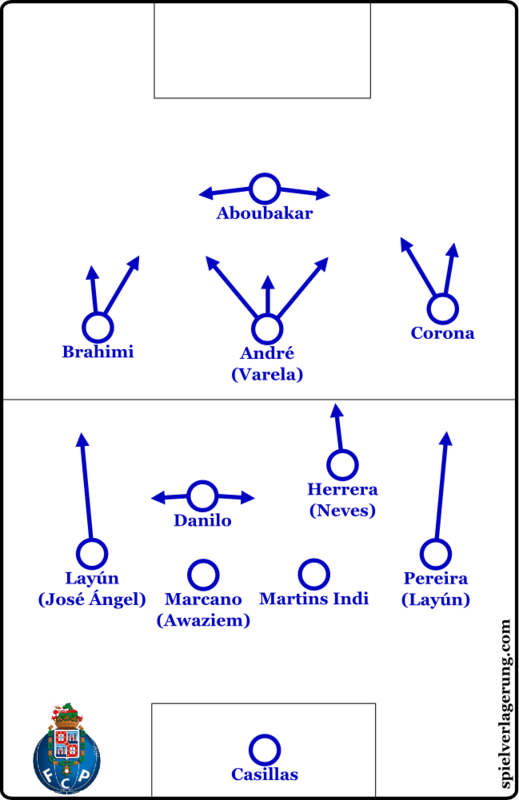 Interestingly, Porto is one of the few sides that looks more dangerous playing a symmetric 4-2-3-1 formation. Their consistent lack of vertical compactness has less impact when fielding two centre-midfielders in front of the back line. Apropos, head coach José Peseiro sometimes gesticulates wildly at the sideline, demanding from his players to narrow the formation. The fundamental tactical problem is known. The number ten player in a 4-2-3-1 shape offers more presence in between the opposing lines. Particularly André André intelligently moves around the centre-forward, while dragging man-markers off the back line, so that advancing wingers, who therefore do not have to force one-on-ones, could run into open spaces. The improving set-up in midfield enables more flexibility to react to various pressing schemes. Porto’s defensive efficiency is hard to judge. When playing against domestic competition, they can use their abilities in duels and counter-pressing to solve dangerous situations with ease. On this side of the ball, they usually apply a man-marking scheme in the first level and a zone-coverage in the second level of the defence. After Porto rather surprisingly sacked Julen Lopetegui in January, the team have had time to work on certain strategies with their new head coach Peseiro. However, the hiring of Peseiro led to a simplification of tactical processes, which appears to be a bad development in their case. Lopetegui, from time to time, sprung a surprise that could cause confusion on the opponents’ side. For instance, he pulled a 3-5-2 system out of his trick book against Chelsea in the last match of the Champions League group stage. He focused on central overloads, yet Porto lacked attacking penetration and could not cover the zones on the other side of the field, which made them vulnerable to cross-field passes. Interestingly, opposite weaknesses caused defeats against other teams. Those ups and downs as well as loss of points in important matches weakened Lopetegui’s position within the organisation. It has to be mentioned, though, that Porto’s versatile players are made for flexible systems. If Peseiro, however, is able to completely use the skill sets of the likes of Rúben Neves and Héctor Herrera remains questionable. More importantly, a certain footballing identity, that distinguished Porto from other teams in the past, is basically missing at the moment. In that context, pointing at players who recently left the club does not count as a valid argument, as many of the signed players would fit the old philosophy of the Dragões. Even if the performance capability has been diminished in general, that does not necessarily have to lead to tactical one-dimensionality. Could Porto be a threat to Borussia Dortmund in their Europa League encounter? Under Thomas Tuchel, Dortmund have developed such a sophisticated attacking structure, that they will almost always contrive ways to enter the zones behind a back line of a deep sitting team. Though, they tend to struggle when an opposing side apply an intense, mostly man-orientated, middle press. Disappointing performances against Ingolstadt, Hertha BSC, and Hannover after the winter break made that clear. In this respect, Porto could trouble them, if they will make use of curve runs to pressure Dortmund’s players who are involved in the early build-up, while applying an intense man-marking scheme in the second level. Bayern Munich supporters likely remember the match at Porto in the quarter-final of last year’s Champions League. Jackson Martínez and Ricardo Quaresma, who both left the club last summer, punished Xabi Alonso and Dante for their weak positional awareness. Against Dortmund, a horizontally compact pressing line coupled with a vigilant zone-coverage behind it could keep Dortmund’s playmakers, Julian Weigl and İlkay Gündoğan, out of the space between Porto’s lines. At times, the Black and Yellows tend to be torn apart, lacking presence in midfield, when they are not able to enter the central zones without being threatened to lose the ball. That symptom leads to long and dangerous passes coming out of the backfield, which could cause quick turnover and enable Porto to attack in quick transition plays. A tactical approach that aims to pressure the opposing playmakers by containing their runs could work out perfectly. Peseiro, however, is not known for this style of play, as he is not known for any specific philosophy, which is a fundamental problem at the moment.